Please note that the content of this book primarily consists of articles available from Wikipedia or other free sources online. Pages: 92. 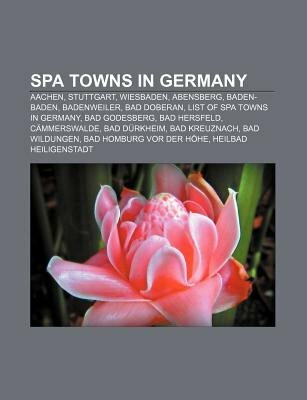 Chapters: Aachen, Stuttgart, Wiesbaden, Abensberg, Baden-Baden, Badenweiler, Bad Doberan, List of spa towns in Germany, Bad Godesberg, Bad Hersfeld, Cammerswalde, Bad Durkheim, Bad Kreuznach, Bad Wildungen, Bad Homburg vor der Hohe, Heilbad Heiligenstadt, Bad Pyrmont, Bad Arolsen, Titisee-Neustadt, Bad Driburg, Bad Kissingen, Bad Endbach, Zingst, Biedenkopf, Warnemunde, Bad Fallingbostel, Braunfels, Bad Oeynhausen, Bad Staffelstein, Bad Elster, Bad Mergentheim, Bad Ems, Bad Aibling, Bad Neustadt an der Saale, Bad Reichenhall, Bad Honnef, Bad Gandersheim, Bad Muskau, Bad Zwesten, Zinnowitz, Bad Sackingen, Bad Wildbad, Bad Liebenwerda, Bad Schmiedeberg, Bad Vilbel, Sankt Margen, Ahrenshoop, Heringsdorf, Mecklenburg-Vorpommern, Hohegeiss, Bad Neuenahr-Ahrweiler, Bad Niedernau, Bad Salzuflen, Bad Konigshofen, Bad Segeberg, Bad Worishofen, Bad Kosen, Bad Bergzabern, Bad Krozingen, Bad Schwartau, Bad Abbach, Alexisbad, Bad Elster Spa Museum, Bansin, Lower Bavarian Spa Triangle. Excerpt: Stuttgart (German pronunciation: ) is the capital of the state of Baden-Wurttemberg in southern Germany. The sixth-largest city in Germany, Stuttgart has a population of 600,038 (December 2008) while the metropolitan area has a population of 5.3 million (2008). The city lies at the centre of a densely populated area, surrounded by a ring of smaller towns. This area called Stuttgart Region has a population of 2.7 million. Stuttgart's urban area has a population of roughly 1.8 million, making it Germany's seventh largest. With over 5 million inhabitants, the greater Stuttgart Metropolitan Region is the fourth-biggest in Germany after the Rhine-Ruhr area, Berlin/Brandenburg and Frankfurt/Rhine-Main. Stuttgart is spread across a variety of hills (some of them vineyards), valleys and parks - unusual for a German city and often a source of surprise to visi..